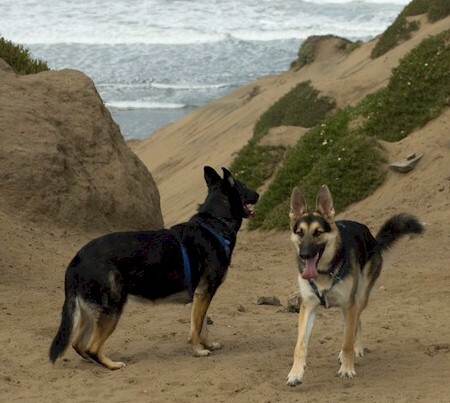 Fun at Fort Funston, Rivi on left, Toby on right, both Alum's. Toby is now a certified Therapy Dog for Paws for Healing!!!!!!!!!!!. He passed his checkride with flying colors!!!!!!. 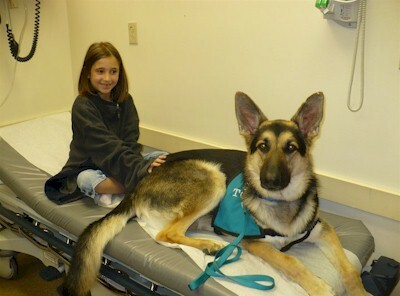 He is providing Canine Assisted Therapy at David Grant Medical Center. When I get a pic of him in his uniform, I will send it to you. The pic attached is from when we completed our first day of training... 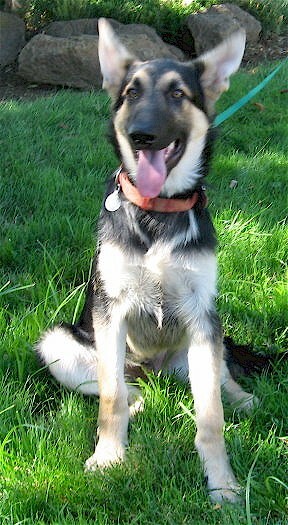 He is now weighing in at 94 pounds and will be turning 2 on the 28th of Feb. Not bad for a knucklehead! 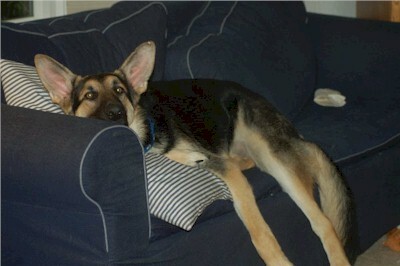 Toby: Told you the couch was too small. thanks to Sue B for matching us with this fabulous knucklehead. 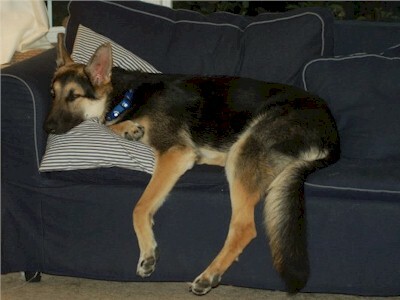 Toby: "This couch is too small"
Tobias is a 6-month-old sweet, adorable, funny, happy male puppy. 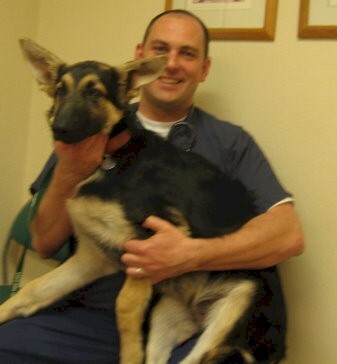 When his previous owner brought him home at age five months, he realized Tobias was limping and took him to the vet. 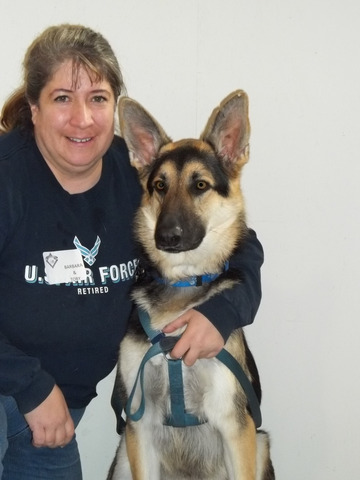 X-rays showed the pup had elbow dysplasia, and surgery was recommended, but the $2,000 estimate was more than his owner could afford, and poor Tobias landed at the local shelter. 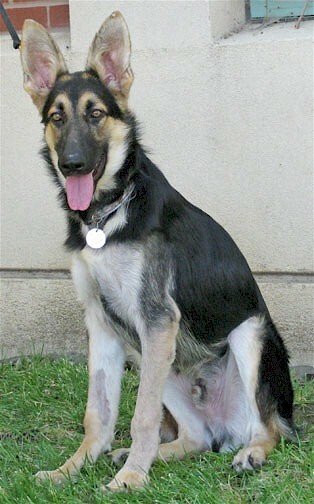 Fortunately, the owner found out about Rescue and started emailing, asking for help for Tobias. Two GCGSR volunteers made the trip to Butte County to evaluate Tobias. How could you not love such a sweet boy? Of course he came home with us! Additional x-rays confirmed the original diagnosis, and Tobias had his elbow repaired on 8/6/09. As of his 4-week checkup he was healing right on schedule. Tobias' youth played a huge role in the success of the surgery. The elbow had not been damaged, and the surgeon was able to repair it. With a screw, a steel rod, careful post-op care and rehabilitation, and a few weeks rest, Tobias is expected to be pain-free and able enjoy a normal life. He is already bearing full weight on the leg with no sign of pain; in fact, he thinks he's ready to go romp and play, though he actually has a few weeks to go before he can be allowed to enjoy off-leash privileges. Between Smoky's, Tobias's and now Knox's surgery, our Rainbow Fund has been seriously depleted. Your tax-deductible donation of any amount will help us care for these wonderful dogs. 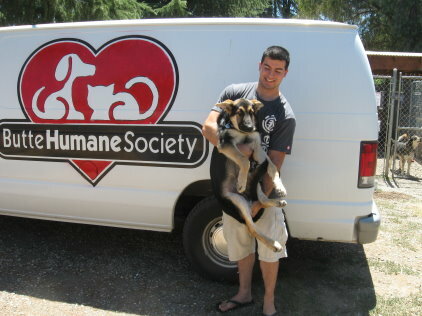 We are a small non-profit organization and depend entirely on donations and adoption fees. With your help, we can save wonderful, deserving dogs like Smoky, Tobias and Knox. Without it, our ability to help dogs with special medical needs is severely limited at best. Please reach into your heart and wallet and send what you can to help these deserving dogs. Thank you!